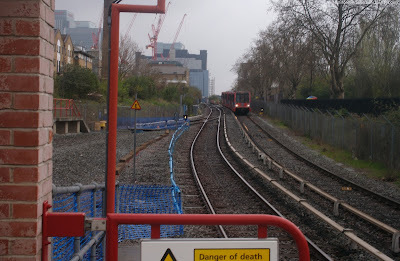 Mudchute DLR station has a siding behind the northbound platform for storing failed trains and where trains terminating at Crossharbour can go to reverse*. As part of rebuilding the station for the three-car project, the siding will be turned into a third platform so that passengers can board trains reversing there instead of having to use the crowded trains arriving from Lewisham. The planning application is here. It includes before and after plans and a short rationale. The station will gain full length platform canopies during the work - something that will also happen at other stations. I was wondering what was happening here - mystery solved, thanks. So this will provide extra peak services from Mudchute towards Bank/ Tower Gateway (and vice versa), given that the trains arriving from Lewisham are already packed. That's great, but will injecting more trains at Mudchute place any limitations on the number of trains running up from Lewisham - which are after all in great demand - or is the real limitation at work here the number of trains that can be turned at the two platform DLR terminus at Lewisham? Excellent - thanks for finding this. I have been following this for months but didn't realise that we're getting a third platform. The previous situation was maddening. You'd sometimes have an empty train in the siding - a totally packed platform - and the blinkin train would vanish off to Crossharbour with not a soul on it. It would appear they don't think there's any need to saturate the Lewisham branch, at least not all the way to Lewisham. It'll get a big boost in capacity once three-car trains start running. That leaves track capacity for the Stratford-Canary Wharf service to be extended south a few stops, which it already is as far as Crossharbour, and this project will extend it to Mudchute. Current Peak Services involve trains from Stratford terminating at Crossharbour so the trains can return to Canary Wharf quicker, which is why they sometimes terminate at Canary Wharf itself. However, more passenger traffic is appearing further south of Canary Wharf, which is why this service is being extended. Current tph for the Lewisham - Bank service will be unaffected. Also, the operational advantages of having an extra platform is one of the reasons this station is being expanded. On a note of speculation, could this possibly create another river crossing toward Surrey Quays or that direction, maybe New Cross? True but the DLR could provide local stations focusing on residential areas or regeneration areas, which is why the Stratford International Extension is being built with stations at Star Lane, Abbey Road and Stratford High Street, as these will serve residential areas that the Jubilee does not.